Feelin' Hot Hot Hot! Black Suede Ballerinas Crafted in velvety suede, sets your style on fire. 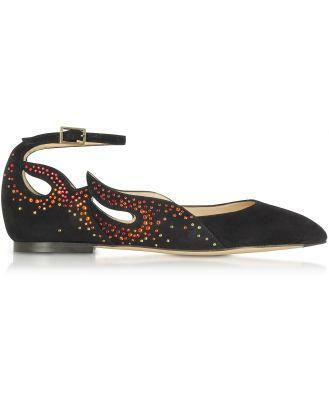 Featuring suede ballerina design with buckle ankle strap, cut-out flame with multicolored crystal detail, rounded toe, small stacked heel and leather sole. Made in Italy. This is the lowest price seen on this item at Forzieri in the last 60 days!